Now you can restore a damaged tooth in just one dental visit. Are you dealing with dental damage due to an injury, decay or an infection? If so, the health of your tooth may be compromised. When this happens one of the best ways to restore a tooth is with a dental crown, a tooth-shaped restoration that covers over a tooth to protect it. 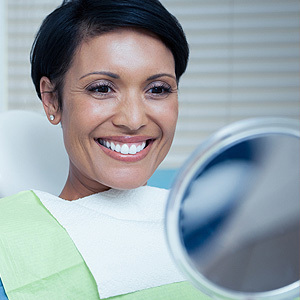 While getting a traditional crown often take 2-3 visits, our Abington, PA, dentists Drs. Cary and Jonathan Limberakis can now restore a tooth with a dental crown in just one visit with help from CEREC technology. The purpose of a dental crown is to cover the entire visible portion of a tooth to protect it from further damage. A crown will strengthen and restore the tooth while preventing the tooth from becoming weaker over time. If a tooth is cracked, severely decayed or has an infection, our Abington, PA, general dentists may recommend getting a dental crown to restore your smile. Our goal as your dentist is to make sure that you always have a pleasant experience whenever you walk through our doors. With that said, we also understand that our patients lead busy lives and often find it difficult to keep coming back for multiple appointments. Now if you need to get a dental crown in Abington, PA, you can get your new restoration created and placed in the same day, which will significantly cut down on your treatment time and allow you to get back to your daily routine faster. When it comes to getting a traditional crown, the tooth always has to be prepared to make room for the new restoration; however, it can take up to a week or more to get a permanent crown, which means that a temporary crown has to be placed to protect the tooth in the interim. Unfortunately, temporary crowns aren’t as strong as permanent ones and you may have to avoid certain foods, which could damage the crown or cause it to fall out. However, when you get CEREC crowns you don’t even have to worry about wearing a temporary crown. Do you want to find out if same day crowns are right for you? Want to learn more about this restorative dentistry technique that could improve the health of your smile? If so, call Limberakis Family Dentistry in Abington, PA, today to schedule a consultation with us. Do you wish there was an easy way to correct the little things you don't like about your smile? Dental veneers not only conceal minor flaws, but can also change the appearance of teeth. Abington, PA, dentists Drs. Cary and Jonathan Limberakis explain how you can benefit from veneers. Constructed of durable porcelain, veneers are designed to hide imperfections in the fronts of your teeth. When you visit our Abington office for your first veneer appointment, we'll remove a thin layer of enamel from your teeth. Although veneers aren't any thicker than a fingernail, they would feel a little bulky if we didn't first buff off a small amount of enamel. We'll also make an impression of your mouth, which will be sent to a dental laboratory. Technicians at the lab will use the impression to create tooth-shaped shells custom-made for your mouth. When you arrive for your second appointment, we'll check the fit of your veneers, make any minor alternations needed, then attach them with dental cement. You'll see us again in a week or two for a brief follow-up appointment. Veneers are an excellent choice if you have a cosmetic issue that only affects the front surfaces of your teeth. They're often used to hide uneven tooth surfaces, chips and shallow cracks. In addition to concealing imperfections, veneers can fill gaps in your smile and change the shape or length of teeth. Whether you have a twisted or crooked tooth, or your teeth have gotten a little shorter due to grinding, veneers can dramatically transform your smile. Do you have a discolored tooth? Veneers offer a simple way to address discolorations caused by injuries, dental work or tetracycline use. When all of your teeth are stained or discolored, veneers offer an alternative to teeth whitening. Veneers are very resistant to stains, look completely natural and are available in many shades of white. Proper care is the key to keeping your veneers in good condition. You'll need to floss your teeth daily and brush them with a non-abrasive toothpaste. Because veneers can chip under extreme pressure, your teeth should never be used to open packages or bottles. As long as you follow these simple guidelines, you can expect your veneers to last 10 to 15 years or longer. Enhance your smile with veneers. Call Abington, PA, dentists Drs. Cary and Jonathan Limberakis at (215) 886-8866 to schedule your appointment. You may have just one issue about your smile that bothers you, or you may have a dozen things you’d like to change. No matter how many issues you want to improve about your smile, porcelain veneers are the answer you’ve been waiting for. Your dentists at Limberakis Family Dentistry in Jenkintown, PA, Dr. Cary Limberakis and Dr. Jonathan Limberakis, want to share the facts about how porcelain veneers can help your smile. When you choose porcelain veneers, you are choosing a minimally-invasive, conservative treatment because only a tiny amount of tooth structure is prepared, just enough to accommodate the thickness of the veneers. You can also look forward to easy-care. That’s because porcelain doesn’t pick up stains like normal tooth structure, according to the American Academy of Cosmetic Dentistry. That means you can have a beautiful smile and still have your morning coffee! Don’t forget that porcelain veneers are also the perfect choice to give your smile that extra WOW factor if you have a special event coming up. Imagine a bright, perfect smile just in time for a wedding or class reunion! Porcelain veneers require between 2 and 3 appointments; a consultation appointment, tooth preparation appointment, and a final cementation appointment. You can have a spectacular new smile in a couple of weeks! If you have one or more issues about your smile that you’d like to change, it’s time for you to investigate porcelain veneers. For more information about porcelain veneer treatment and other dental services call your dentists at Limberakis Family Dentistry in Jenkintown, PA. Find out how porcelain veneers can improve your smile by calling today! Does the appearance of your yellowed or discolored teeth make you feel self-conscious or avoid smiling? If so, you could benefit from one of the leading and most quick and easy cosmetic dentistry procedures available. This unique treatment will lift the color of your teeth to give you the confidence boost you desire. Learn more about teeth whitening with Limberakis Family Dentistry in Abington, PA.
Teeth whitening uses the chemical reactions between stains on your teeth and the whitening gel used during the procedure to improve the appearance of stains and discolorations on the teeth. This works at the molecular level, breaking the bones which hold together a stain’s molecules to diminish the stain itself. This provides a whiter and brighter appearance. Teeth whitening treatments take about an hour and occur right in your dentist’s office. A good candidate for teeth whitening treatments should begin good dental health with no instances of tooth decay or gum disease. If these conditions are present prior to your teeth whitening session, your dentist will want to clear them up before administering the whitening treatment. Teeth whitening does not work on porcelain materials, making patients with visible porcelain dental restorations such as veneers or bridges bad candidates for whitening treatments. Your whitening session will begin with a consultation to ensure that you and your dentist are on the same page as far as your results, how white you would like your teeth and the steps of the procedure. Then, your dentist will apply whitening gel to your teeth after sectioning them off from the rest of your oral tissues. The gel sits on the teeth for about an hour, often accompanied by a special whitening light directed at it to speed up the process. After an hour, your dentist will rinse the gel and you may return to your daily activities. For more information on teeth whitening, please contact Dr. Cary Limberakis and Dr. Jonathan Limberakis at Limberakis Family Dentistry in Abington, PA. Call (215) 886-8866 to schedule your appointment today!